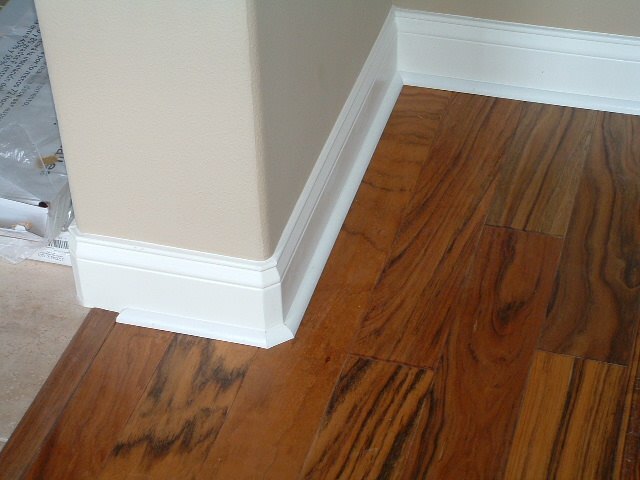 In some homes there may be rounded corners and you may find yourself installing quarter round on round corners. I don't know of a pre-made quarter round to go around the curved corner. The best way to do this is to cut a little piece that covers the curved corner. This basically covers outside corners. 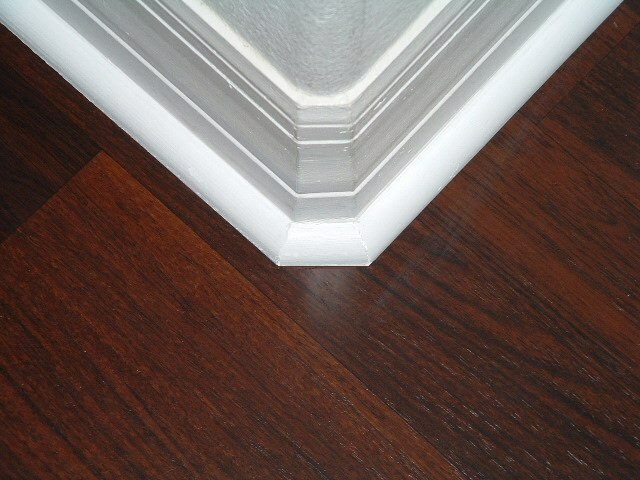 Outside corners are mostly 90 degree corners, which is like the corner of a square. 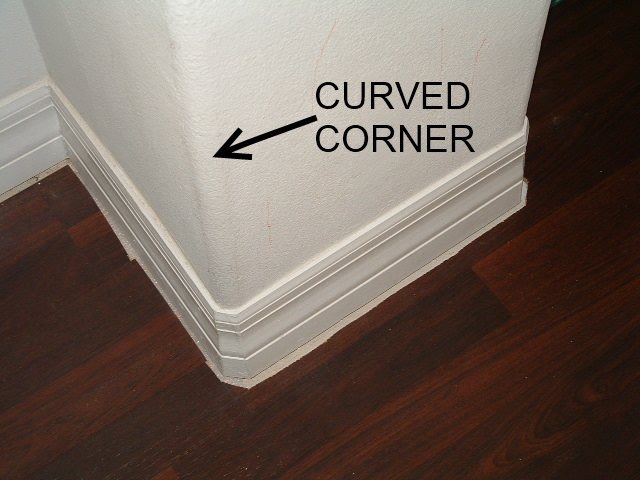 The rounded corners on walls means the point to the corner is cut off. 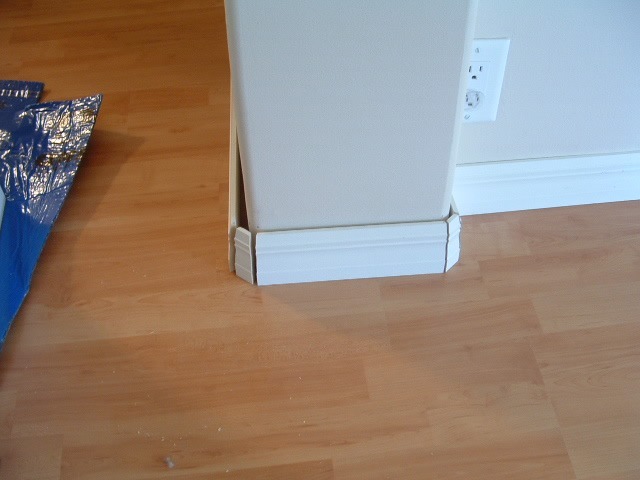 Installing base board on curved corners will be the same process as quarter round. In this first photo I have installed the laminate flooring up to the existing base board. Now I need to install the quarter round onto the base board. If you click on the photo you can see how the base board has a small piece to cover the curve of the wall. I will do the same thing with quarter round. Here all the pieces that cover this corner will be cut at 22.5 degrees. Most miter saws have this setting pre-marked on the saw. The corner itself is 90 degrees and all the cuts (four in all) will equal 90, 22.5 X 4 = 90. The same goes for a regular square corner where you would cut each of two pieces at 45 degrees each, 45 X 2 = 90. Whatever the total angle of the corner is means, all the cuts will be equal to total of the angle. Position the piece of quarter round in place, and make a mark at the corner of the base board. 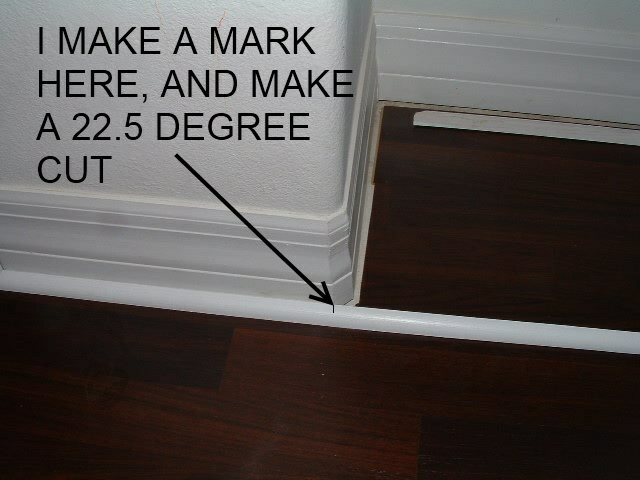 If there is no base board, make the mark where the curve of the wall starts. Using a miter saw cut this at a 22.5 degree angle, setting the saw to the right at 22.5 degrees in this case. After making the first cut, cut a 22.5 degree in the opposite direction on the next piece. Hold this cut up to the first cut and mark at the corner where the base board meets. When cutting this small piece be careful as the small pieces may fly off the saw. Make sure to always wear eye protection when cutting on the miter saw. Here you can see the 45 degree angle in the corner and the 22.5 degree cuts on the rounded outside corner. After making all the cuts, use a nail gun to nail them onto the wall. A good size nail is 1 1/2 or 2 inch 18 gauge brad nails. The 18 gauge nails leave a small hole to be filled in with chalking. 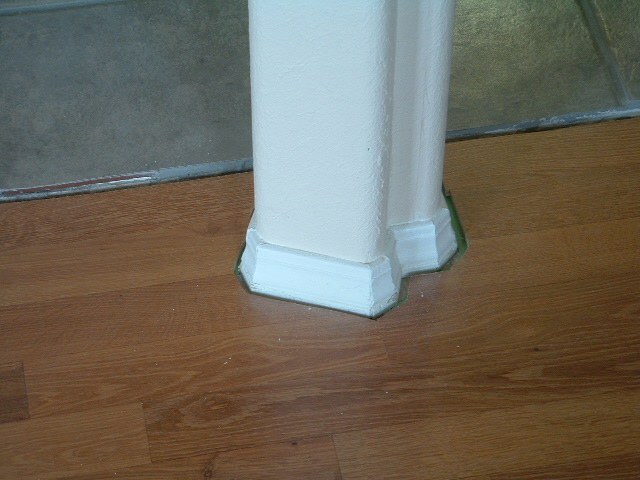 The small pieces that cover the curved corners can be glued on with a good adhesive chalk. This is how you want it to look when your done. Using a good adhesive chalk to fill in any spaces or gaps. Run a bead of chalk along the top side of the quarter round, rub it in with your finger and wipe it down with a wet rag. 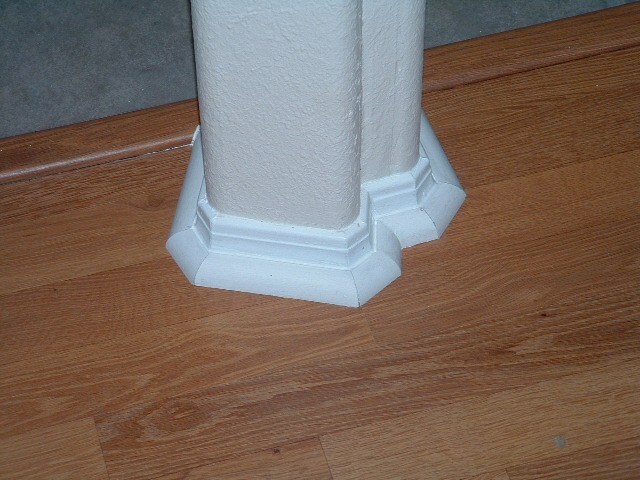 Before and after of an odd shaped pillar that needed quarter round installed around it. Here is 3 1/4 inch base board being installed around curved corners. 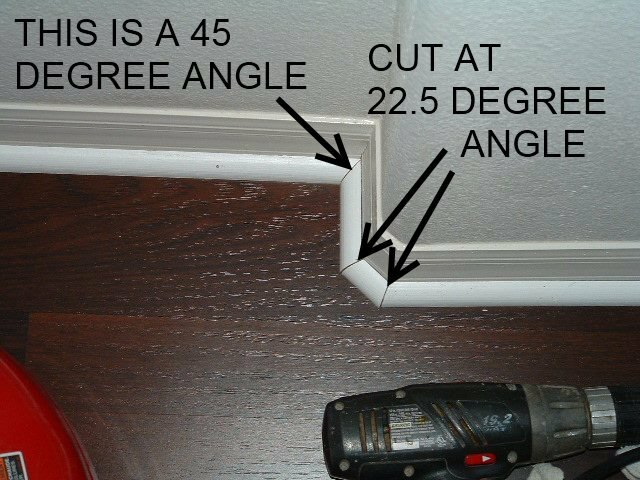 All the cuts and angles are the same as installing the quarter round. Finished quarter round installed on a rounded corner. 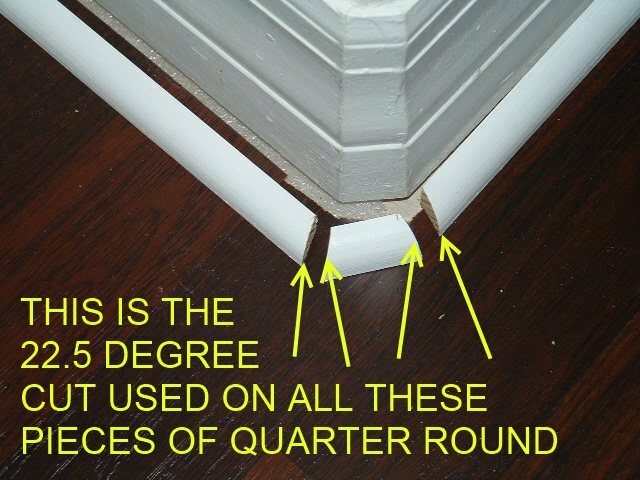 A quarter round return is where the quarter round ends in the open, such as where it stops at a door jamb. A return is a way to cover the cut end. Here I explain how to cut the quarter round return.